The absorption cycle uses a heat-driven concentration difference to move refrigerant vapors (usually water) from the evaporator to the condenser. The high concentration side of the cycle absorbs refrigerant vapors (which, of course, dilutes that material). Heat is then used to drive off these refrigerant vapors thereby increasing the concentration again. Lithium bromide is the most common absorbent used in commercial cooling equipment, with water used as the refrigerant. Smaller absorption chillers sometimes use water as the absorbent and ammonia as the refrigerant. As you can probably guess, the absorption chiller must operate at very low pressures (about l/l00th of normal atmospheric pressure) for the water to vaporize at a cold enough temperature (e.g., at ~ 40°F) to produce 44°F chilled water. The simplified diagram here illustrates the overall flow path. Starting with the evaporator, water at about 40°F is evaporating off the chilled water tubes, thereby bringing the temperature down from the 54°F being returned from the air handlers to the required 44°F chilled water supply temperature. One ton of cooling evaporates about 12 pounds of water per hour in this step. This water vapor is absorbed by the concentrated lithium bromide solution due to its hygroscopic characteristics. The heat of vaporization and the heat of solution are removed using cooling water at this step. The solution is then pumped to the concentrator at a higher pressure where heat is applied (using steam or hot water) to drive off the water and thereby re-concentrate the lithium bromide. The water driven off by the heat input step is then condensed (using cooling tower water), collected, and then flashed to the required low temperature (40°F in our illustration) to complete the cycle. 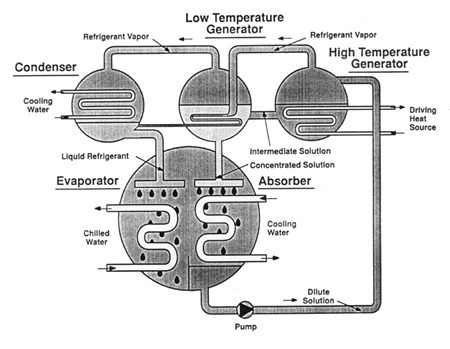 Since water is moving the heat from the evaporator to the condenser, it serves as the refrigerant in this cycle. There are also absorption chillers in use (e.g. in motor homes) that use ammonia as the refrigerant in the same cycle. The absorbent is the material that is used to maintain the concentration difference in the machine. Most commercial absorption chillers use lithium bromide. Lithium bromide has a very high affinity for water, is relatively inexpensive and non-toxic. However, it can be highly corrosive and disposal is closely controlled. Water of course is extremely low cost and safety simply isn't an issue. Single Effect (1-Stage) Units using low pressure (20 psig or less) as the driving force. These units typically have a COP of 0.7 and require about 18pph per ton of 9 psig steam at the generator flange (after control valve) at ARI standard rating conditions. Double Effect (2-Stage) Units are available as gas-fired (either direct gas firing, or hot exhaust gas from a gas-turbine or engine) or steam-driven with high pressure steam (40 to 140 psig). These units typically have a COP of 1.0 to 1.2. Steam driven units require about 9 to 10 pph per ton of 114 psig input steam at ARI standard rating conditions. Gas-fired units require an input of about 10,000 to 12,000 Btuh HHV per ton of cooling at ARI standard rating conditions. To achieve this improved performance they have a second generator in the cycle and require a higher temperature energy source. Provide chilled water for cooling when low pressure steam, cooling tower (or other water for heat rejection), and electric power is available. Provide chilled water for cooling when clean, hot exhaust gas, cooling tower (or other water for heat rejection), and electric power is available. When steam in the 12 to 20 psig range from a process or other steam use is available at little or no cost (i.e. steam would otherwise be wasted). When the heating load cannot be readily served by an existing boiler and it can be served from this chiller/heater, thus avoiding adding a boiler or where space is not available for a boiler. When emergency cooling capacity is needed and stand-by generation capacity is not available to operate electric cooling. (Consider adding emergency generation capacity, which may be lower in cost than absorption cooling capacity). Where cooling is required and clean exhaust gas is available, emitted from an industrial process such as those related to printing, drying, or baking. When steam in the 12 to 20 psig range from a process or other steam use is available at a reasonable cost or where boilers must be operated for other reasons and the user is looking for other steam uses to adequately load the boiler. When steam in the 40 to 140 psig range from a process or other steam use is available at a reasonable cost or where boilers must be operated for other reasons and the user is looking for other steam uses to adequately load the boiler, Replacement for existing inefficient single stage steam chiller without an electrical service upgrade. Where clean exhaust gas is available and there are cooling requirements. Operations are planned to use absorption chiller as a peak shaving unit. Absorption chillers require added time and effort to bring on- and take off-line. Operators tend to end up using absorption as a base chiller and peak with the electric chiller, thereby defeating the purpose and actually adding to, rather than saving, operating cost. Extended operation at 30% and less of design capacity is likely. Operations are planned to use absorption chiller as a peak shaving unit. Absorption chillers require added to time and effort to bring on- and take off-line. Operators tend to end up using absorption as a base chiller and peak with the electric chiller, thereby defeating the purpose, and actually adding to, rather than saving, operating cost. The energy efficiency of absorption can be improved by recovering some of the heat normally rejected to the cooling tower circuit. 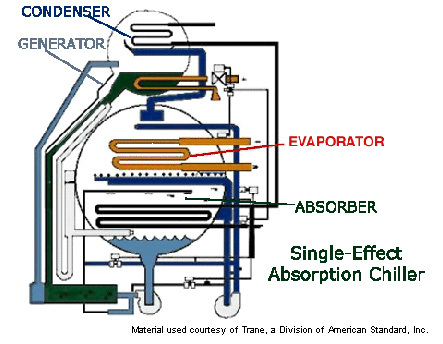 A two-stage or two-effect absorption chiller accomplishes this by taking vapors driven off by heating the first stage concentrator (or generator) to drive off more water in a second stage. Many absorption chiller manufacturers offer this higher efficiency alternative. Notice that two separate shells are used. The smaller is the first stage concentrator. The second shell is essentially the single stage absorption chiller from before, containing the concentrator, condenser, evaporator, and absorption chiller. The temperatures, pressures, and solution concentrations within the larger shell are similar to the single-stage absorption chiller as well. Steam at pressures typically in the l25 - 150 psig range is brought into the stainless steel tubes of the first stage concentrator causing the solution there to boil. The pressure at which boiling occurs and the pressure of the released refrigerant vapor is approximately 5 psig (20 psia). The partially concentrated solution from this first stage flows through the high temperature heat exchanger where it is cooled by the lower temperature dilute solution returning from the concentrator. This concentrate then passes into the lower pressure second stage concentrator where the vapors from the first stage take it to the final desired concentration levels. This second stage operates at a pressure of 0.1 atmosphere (1.5 psia). The reuse of the vapors from the first stage generator makes this machine more efficient than single stage absorption chillers, typically by about 30%. Two-stage absorption chillers are typically driven by high-pressure (60 to 130 psig) steam, direct-fired with natural gas or #2 fuel oil, or using hot exhaust gas from combustion engines. Steam at pressures typically in the l25 - 150 psig range is brought into the stainless steel tubes of the first stage concentrator causing the solution there to boil. The pressure at which boiling occurs and the pressure of the released refrigerant vapor is approximately 5 psig (20 psia). The partially concentrated solution from this first stage flows through the high temperature heat exchanger where it is cooled by the lower temperature dilute solution returning from the concentrator. This concentrate then passes into the lower pressure second stage concentrator where the vapors from the first stage take it to the final desired concentration levels. This second stage operates at a pressure of 0.1 atmosphere (1.5 psia).The reuse of the vapors from the first stage generator makes this machine more efficient than single stage absorption chillers, typically by about 30%. Direct-fired absorption chillers utilize a burner as the heat input for the absorption cooling cycle. Most operate either on natural gas or No. 2 fuel oil. Since the heat input is at a very high temperature, they achieve a very high efficiency for the absorption cycle...something approaching 12,000 Btu of fuel input for each ton hour of cooling output. 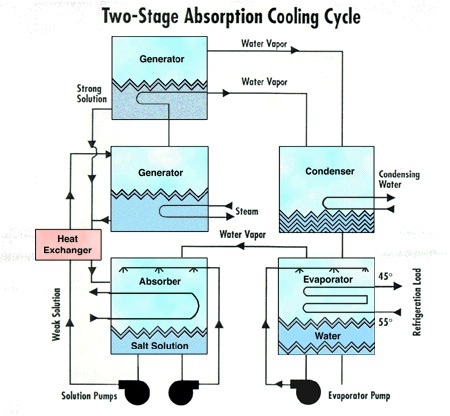 The absorption cycle itself is virtually identical to that of the two-stage steam absorption chillers. However, unlike most steam absorption chillers, the direct-fired absorption chiller lends itself fairly readily to "chiller-heater" applications where both cooling and heating are achieved in the same unit. This can result in a smaller footprint for the boiler room in some situations. Where a boiler can be eliminated by the dual heating and cooling capability of this machine, the cost and space savings can be a significant. In addition, steam is not required, which can be important in situations where local codes require licensed boiler operators for steam-driven units but permit unmanned operation of direct-fired absorption chillers. Direct-fired absorption chillers require a stack to vent combustion products. This is not necessary in a steam-fired unit. In addition, the first cost of direct-fired units are higher than steam driven units. Maintenance costs on the heat rejection circuit tend to be higher due to more rapid scaling. Also be careful to check warranted life of absorption chiller heat transfer surfaces (especially the generator section) and the refrigerant and solution pumps. All absorption chillers use electric power to operate these pumps, the condenser water pumps, and cooling tower fans. They also use more water as they must reject more heat and require larger cooling towers. Absorption chillers are more difficult than electric chillers to put on-line (start up) and to take off-line (shut down) as they require a dilution cycle. All of these issues should be addressed in discussions with manufacturers, designers, and mechanical contractors. Where: m = mass flow rate in pound per hour, Tg = exhaust gas inlet temp (oF) to absorption chiller, and 40,950 = conversion factor. The above COPs do not include auxiliary electric loads, which are typically higher than those of a corresponding size electric chiller. Because of the added heat rejection load, larger towers and condenser water pumps, plus the unit's solution pumps, are required.